Churchill is an Arctic/Subarctic transition zone that includes botany and wildlife from both ecosystems. The link above takes you to the botany section. For some reason, when you run a search on Arctic botany it brings you here, instead of to my botany link. You will hopefully find useful information if you click to the above. 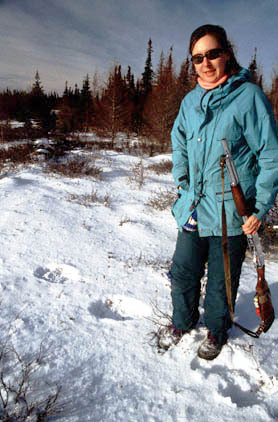 Polar bear biologist, Susan Polischuk, standing in a set of fresh polar bear tracks in the woods near the Churchill Northern Studies Centre. Stranded! A true story about how I found myself stranded, alone and on foot, in polar bear backcountry with only a starter pistol and lightweight aluminum tripod to protect me.